Why would we seek to promote happiness at work? Because being happy increases your productivity. It also breeds success (and not the other way around!). No surprise then that Management 3.0 (aka Managing for happiness) includes the practice “12 steps to happiness”. One of them is exercise. And no, you don’t have to exert yourself with running to get to a runner’s high to reap the benefits. Any exercise at all will promote your feeling of well being and increase your happiness when done regularly. Most important piece of advice I am giving in the blog post on Happy Melly to kick off the “Exercising for Happiness” week: find an activity you enjoy. That will make hard to stop, rather than hard to continue. 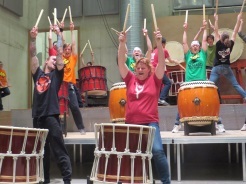 Like Taiko Drumming has become somewhat of an addiction for me. I won’t stop unless/until I can’t move my arms anymore. In addition to that you will find a number of ideas on how you can work exercise into your work environment. Individually or as a team. I would love to build up that list with even more ideas. Turn it into an awesome resource for cheap and cheerful team activities. Please share in the comments what you do to keep moving at work! ‹ Why do you always have to be the responsible one?